I first came across DISC analysis while doing a stint as a ski instructor in Canada last winter (every web designer needs a hobby right?!) and the technique helped me achieve the highest number of new private lessons booked across the adult ski school. To truly understand the value of DISC analysis to the web designer and usability expert we first have to understand what on earth it is. Mostly, DISC analysis allows you to consider your client or clients (think website audience) as one of four possible personality types. To make it easier to interact with, I prefer to consider each category as resembling one of four distinct ‘birds'(!). 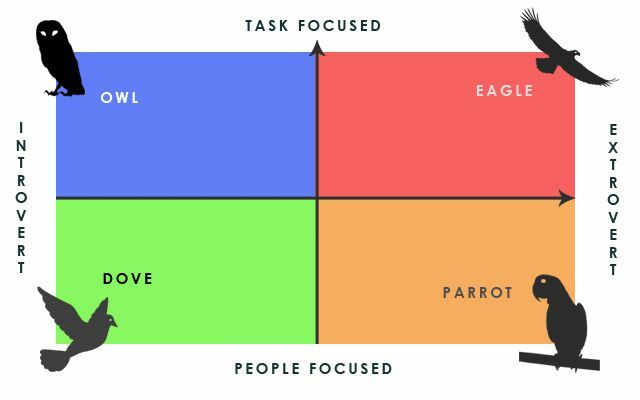 You are, and equally your website’s audience is likely to be, predominantly Eagle (Decisive, strong willed & direct), or Owl (Precise, logical & quiet), or Parrot (Sociable, persuasive & enthusiastic) or Dove (Calm, caring & patient). What am I? And what Category does my Audience fit into? You can find out exactly what you are by taking a free online test here. * Discovering your own personality type may help you take some decisions to improve not only your websites but also your lifestyle. Take me; I’m an Owl (75%, Dove 25%). That means I am unlikely to take risks without fully comprehending the potential results. While a sensible approach, the consequence of my ‘natural’ deliberation, where others (think Eagles!) react quickly, is that I might ‘miss the boat’. Knowing I’m an Owl and understanding my weaknesses allows me to send a siren off in my brain every time a risky opportunity arises. I think to myself: if I spend too much time researching, might I act too late? I do this because I have used my Owl-like logic to identify that risk-taking is a key component of success, which is my ultimate goal. At times, I will mimic an Eagle if it suits me to do so. 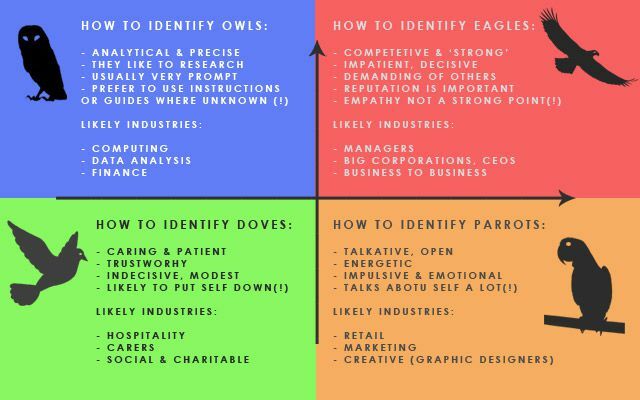 * Note that the results categories are as follows – Compliance (OWL), Steadiness (DOVE), Dominance (EAGLE), Influence (PARROT). Lets say you are doing a website for a charity. You might want to think about targeting Doves and Eagles. Doves are the most caring; they are the most likely to be swayed by their empathy for others. If your charity has a really good cause and some great images that highlight the need for assistance on an emotional level then this will affect the Doves the most. It is a good strategy for incentivising your likely audience to give to a deserving charity and a well known one. We’ve all seen a ‘hard-hitting’ advert or two, but knowing what we know about Doves, I’d recommend avoiding the really hard hitting stuff. Instead, ease them into the website carefully and focus more on how their support can really help – let them empathise with the eventual happiness of others. And don’t forget the Eagles! It might not have escaped your attention that the likely industries for Eagles include some of the most high-paying jobs. Eagles have a high level of disposable income but they’re task focused so need to be given the feeling that they are achieving something, you have to celebrate an Eagle! If you are targeting the staff rather than the consumer then bear in mind that those working in the social and charitable industries, for instance, will not all be Doves. Similarly, Doves too can be found and can succeed in a multitude of industries. Being one category does not limit you to an industry, it is simply that you will find a greater proportion of Doves in the social and charitable industries because this it is a style of work in which they often excel. The work comes ‘naturally’ to them, and therefore it takes less effort for them to be effective than it would say, an Owl or a Parrot. As a working example, knowledgeable or not, Apple is the most prominent example of targeting Parrots with its web design and its marketing in general. The implication of their adverts is that if you don’t have the latest (shiny, thin, cool) model/piece of tech, then you will be left behind socially. The more I use these techniques, the more I think that targeting Parrots is a good strategy: they are the ones who talk a lot on social media sites, they have the most ‘friends’, they do half your marketing for you! The image above, a print screen of an advert on Apple’s own website, may as well say that the new iPhone 5C is ‘For the Parrot’. Parrots are likely to identify with the idea that they are a vibrant, colourful person, living life to the full. You probably know a Parrot, its the person in your life who arranges the parties in your friendship group, has all the latest Apple gadgets and doesn’t know how to use any of them! They won’t mind me saying that either, they love the character they embody and why not, they are geniuses when it comes to promotion. When I was last working at Linedot.co.uk we purposefully implemented four separate variations of the same device, the web design package selection page, to target each and every one of the personality types. The logic is really simple. 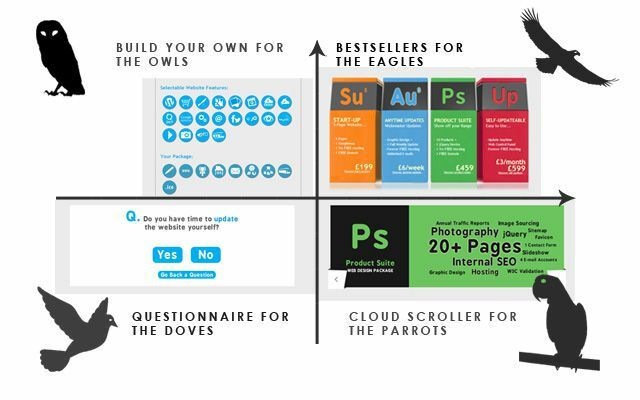 Eagles like the bottom line so Linedot tells them which web design packages sell best, and quickly. Owls often know exactly what they want so Linedot gives them the option to tailor their new website package to their own needs. Doves like the guidance of an expert to help make decisions so Linedot points them in the right direction. And Parrots like things to be visually outstanding so Linedot provides them with a jQuery device with an eye-catching design style. Designing a website or web device for your opposite category can be tough! When building that Cloud Scroller mentioned above, I struggled to shake a sceptical mind-set. I couldn’t bring myself to see the cloud scroller as effective, honestly speaking its not that functional and doesn’t explain the details! It took me a while to realise that the reason I felt that way is because I am an Owl. I loooove the details and functionality, but Parrots don’t. The cloud scroller suits them down to the ground (although there is plenty room for improvement, watch this space)! Here’s a few simple rules on how to identify your key category and then how to adjust your client’s website to improve the user experience. We’ve covered everything you need to know to get a good grip on the subject. By all means, get involved and find out more. DISC analysis has a huge impact on our world today, it’s used by some big corporations (and clever small ones)! The generalisations of DISC analysis are not judgements and are useless as a means to put people down, everyone’s own personality is viable and unique, but pay attention to these quirks of psychology, and you may improve your chance of success. DISC analysis isn’t just for websites. Since learning of its existence, I have personally found it quite helpful in general life too. After thinking about it for a few minutes I realised that all my long-term girlfriends had a lot of Dove in them, that my sister was an Eagle (beware the female Eagle they are extremely effective! ), and that my best mate keeps his flat tidier than mine because he’s even more Owl than I am! Perhaps on a more surprising note, I also now know on what basis my job application for MI5 came unstuck! They sent me a form which it turns out was a DISC analysis. I obviously didn’t suit the role they were recruiting for at the time but the fact that such trust was put into a DISC analysis goes some way to prove the excellence of the tool for guidance and development in web design and other industries.